objectiF – Model-driven Development. By microTOOL. objectiF is the tool for model-driven development and individual model transformations. Generate quickly code from professional UML models, create technical models and run model driven development. objectiF. The Tool for Model-driven Development and Transformations. Create individual transformations from your UML diagrams. Utilize existing means of expression, tailor the transformations to your needs and create code, or generate technical models from domain-oriented models. objectiF provides you with systematical guidance when modeling software systems, with a standardized modeling framework. 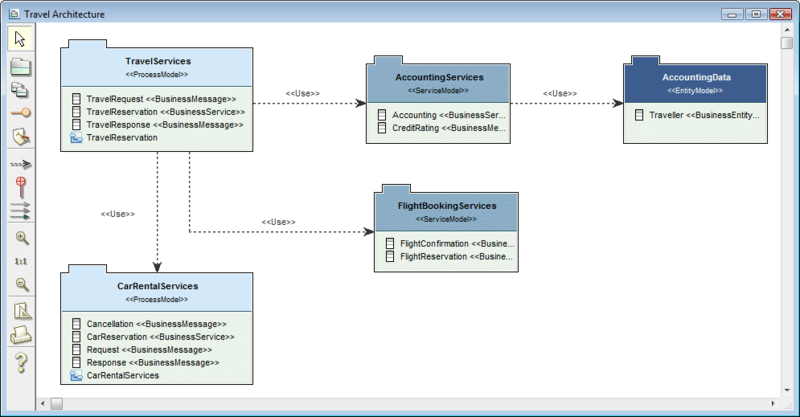 create UML models which can be automatically transformed into technical models and code. a Presentation Model for modeling the user interface. A domain-oriented model is arranged in a package structure in objectiF. You can create it from the system template when generating a new system, with just a few clicks. If you have described the technical aspects of a new application with UML models, you can automatically transform the domain-oriented models into the technical models for the software design with objectiF. Transformations can be easily initiated via context menus. At the same time, objectiF creates a large amount of platform specific source code. You can change domain-oriented models at any time, develop them iteratively and transform them over and over again. Each model transformation is equipped with a mechanism for automatically updating, creating and deleting elements in the technical model. What’s more, everything you change manually in the technical model and code, for example in Round Trip with Visual Studio or Eclipse, remains intact throughout repeated transformations. Do you develop software for a very specific target platform? Does this mean you need specialist model transformations? You can develop your own model transformations in objectiF, simply and in a standard programming language, without having to employ a transformation language. Short & sweet: with objectiF you can get the most out of the automation potential model-driven development offers. Model transformations for standard .NET- and Java technologies. Transform domain-oriented UML models into technical models and code using model transformations. Model transformations are based on re-usable architectural and technological knowledge. That pays off and your architectural standards are adhered to, guaranteed. During the transformation, relationships are created between the domain-oriented and technical model elements. These are used by objectiF for generating navigation functions. You can use these to quickly switch between the domain-oriented model and technical model, and the code. develop new model transformations with objectiF, for objectiF. In objectiF you will find everything that you need for developing model transformations. Model transformations are normal applications in a standard programming language. Altered or new transformations can be easily used on existing domain-oriented models. That way, valuable specialist knowledge isn’t affected by a change in technology. Iterative transformation – ideal when combining with agile process concepts such as Scrum. You can change, extend and transform domain-oriented models at any time. All the manually entered additions made to generated code remain intact during repetitive transformations. Automatically created and consistently maintained navigation functions between domain-oriented and technical model elements. You can switch quickly and easily between your domain-oriented models and the technical models created from model transformation. The automatically provided navigation functions are integrated directly into the objectiF user interface. Round Trip with Microsoft Visual Studio and Eclipse. Complete the generated technical models and code easily in Round Trip with your IDE. Generated code remains unaffected by Round Trip Engineering. Integrated technology for developing your own model transformations. objectiF provides you with a homogenous environment, for model-driven application development and for developing your own model transformations to automate your application development. Generate menu functions for calling up user-own model transformations and navigating. Automatically integrated in the objectiF user interface. The whole team can use model transformations you’ve developed straight away – simply by calling them up from a context menu. There’s no configuration or introductory phase required. Link and re-use model transformations. You can automate the development of entire application families. That means quality and high productivity. Choose from specialized editions for NET-Development in C#, Development in Java and Development in C#, C++ and Java. If you implement with Microsoft Visual Studio .NET in C# or VB.NET, objectiF Visual Studio .NET Edition is the right choice. 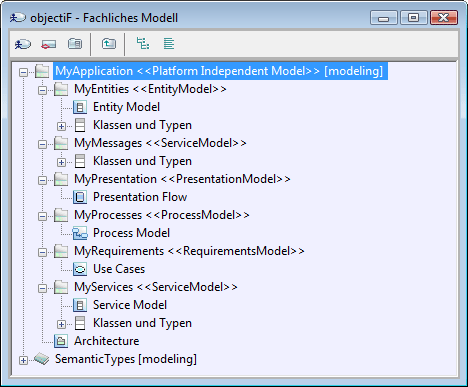 Describe the requirements for a system with UML and generate documentation with objectiF suitable for the target groups. 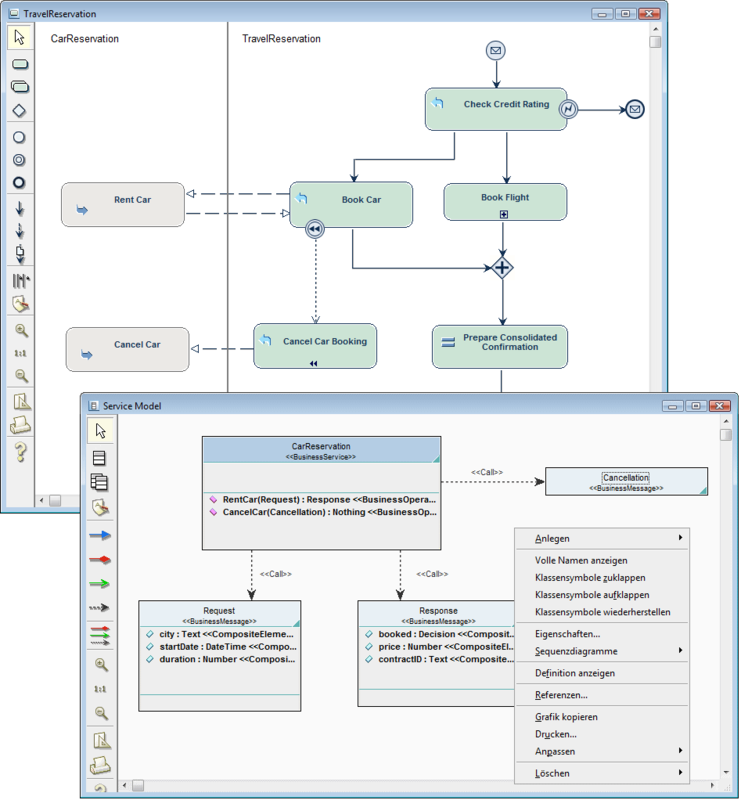 Develop a platform independent model of a system and new business processes with UML and BPMN in objectiF. By model transformation objectiF transforms your domain-oriented models into the technical models of the software design. objectiF generates large amounts of code during transformation for your .NET framework – e.g. for your Rich Internet Application with Microsoft WPF in C# and with NHibernate as Object Relational Mapper. Complete the code in Round Trip with Visual Studio. objectiF and Visual Studio are seamlessly integrated. What if the domain-oriented requirements change? Then alter the domain-oriented model and transform it again. objectiF is designed for model-driven, iterative development. What if the available model transformations don’t fit? Then simply develop your own – with objectiF for objectiF. You are developing in Java with Eclipse? Then objectiF Eclipse Edition is the right choice. and BPEL for your SOA applications. Complete the code in Round Trip with Eclipse. objectiF and Eclipse are seamlessly integrated. implement embedded software applications or other technical applications in C++. EJB, XSD, WSDL and BPEL. Complete the code in Round Trip with Eclipse or Visual Studio. objectiF is seamlessly integrated with both tools. objectiF Enterprise Edition supports team work in mid-size and large teams on an integrated LAN repository with genuine multi-user access. Always current. Always with support. Always convenient. Are you interested in modeling via web browser? Do you already know objectiF RPM – the software for requirements engineering and agile development? You can even use it with your browser. Get in touch with our trained professionals who will really help you.